Note: You cannot buy individual program in this series. You must buy the entire series. Parts 1-4 are on Disc 1 and Parts 5-7 are on Disc 2. "XXI CENTURY" begins with the presidential elections of 2000. What happened in those elections? Who really won the State of Florida? How many Americans could not vote in Florida that day? Why? Who were they? Why was the Supreme Court called upon to decide who was the winner? Did the media do their job? We hear from historian Howard Zinn, who describes the 2000 Presidential Elections as a "political coup" and Gore Vidal, who refers to them as "the end of the Republic." Today, everyone in the world has heard about September 11th, 2001 and its lasting effects. But how many people know what really happened that day? Who were the terrorists who attacked us? Why did they do it? Whose money did they use? BBC and Guardian investigative reporter Greg Palast tells us the "most censored story in America". Gore Vidal provides some penetrating questions about the attack that should have been the subject of intense investigation by the 9/11 Commission, while Princeton historian Arno Mayer introduces the notion that the US is not just the sole superpower, but is in fact an empire. ...and the pursuit of happiness (part II) The aftermath of 9/11: the war on terror, the Patriot Act, the looming Iraq war and massive peace demonstrations. ...and nothing but the truth (part III) Looks at the failure of the mainstream media to ask important questions and cover opposing points of view. war, peace and patriotism (part IV) Patriotism, the 'chicken-hawks' and weapons of mass destruction. civilization (part V) Iraq's history -- from the 'cradle of civilization' to the first Gulf War and UN sanctions. 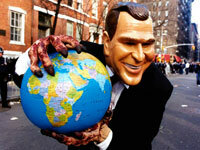 blood and oil (part VI) The stated reasons, and the real reasons, for the Iraq war. pax americana (part VII) Spreading human rights and democracy...or empire? "An exceptionally well done panorama of significant political events surrounding September 11th, 2001 and the American Empire." "Highly revealing! A documentary which celebrates the peace movement while fueling your rage to danger levels." www.paradigmpublishers.com Paradigm Publishers website, publishers of "American Voices of Dissent", the book from the film series.